Following the success of Sternbach’s 2009 monograph, Surfland, which quickly sold out and instantly became a classic in its genre, Surf Site Tin Type (Damiani Editore, 2015) is a stunning continuation that focuses on the symbiotic and close-knit relationship between surfers and their environment. A counter to the stereotypical surfer of popular culture, Sternbach’s subjects are instead timeless proponents comprised of a broad range of ages and ethnicities. Furrow-browed surfers stand stoically under the bright sun with appendage-like boards hugged close - weathered monoliths rising out of the salt and sand. Sternbach has photographed from Australia to Cornwall, England, seeking this rare community in which the volatile natural habitat plays such a key role in the culture. The raw, vividly exposed surfers are both of and within their surroundings. 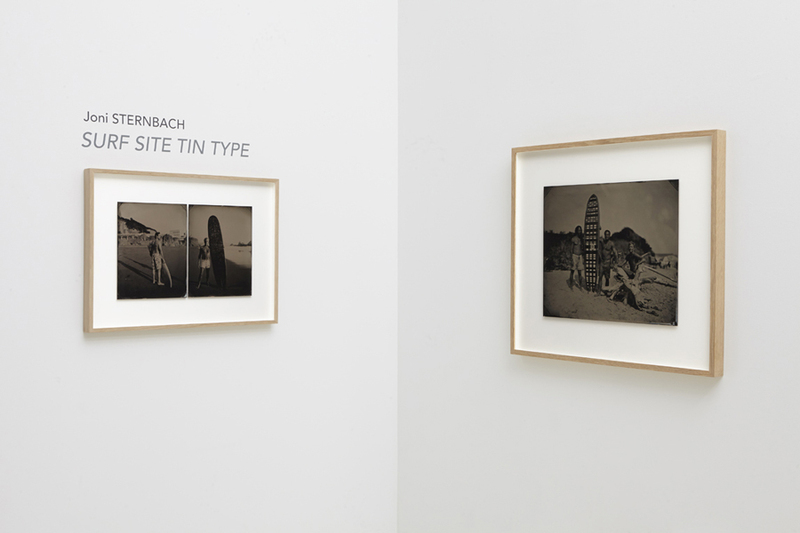 The relationship between the surfers and the environment is analogous to Sternbach’s own photographic process. Resurrecting the19th century, the wet-plate collodion process known as tintype, centers on the photographic plates being coated and developed on site, a home cooked method based on experience and control, more art than science. The crux of Sternbach’s relationship with her environment is the shared dependency and unpredictability that her subjects have with each rising wave. Developed in an on-site darkroom, each plate is uniquely marked by the conditions of the location. The images are true documentation of each time and place, with no room for manipulation or revision. The raw, umber images are seemingly etched out of the land and sea. Sternbach’s one-of-a-kind plates are products of the location in which they are created, just as the surfers’ experiences are products of their setting. Selections from Surf Site Tin Type will be on view in the print room at Rick Wester Fine Art from March 19 – April 25th, 2015. A book signing will take place on Thursday, March 26th, from 6:00-8:00pm. A second book signing will be held Saturday, April 18th from 2:00-4:00pm at the AIPAD Photography Fair, Booth 120. Books are available for purchase at the gallery and on the RWFA website. Please direct inquiries regarding pricing, images, and information to Jana Brooks at +1 (212) 255-5560 or rwfa@rickwesterfineart.com.